Justice Dennis M. Perluss explains the short timeline for developing new rules to change court procedures for the review of death penalty cases. Council meeting attendees check out the Monterey Superior Court's online app for looking up cases, searching calendars, and making traffic payments via smart phones. 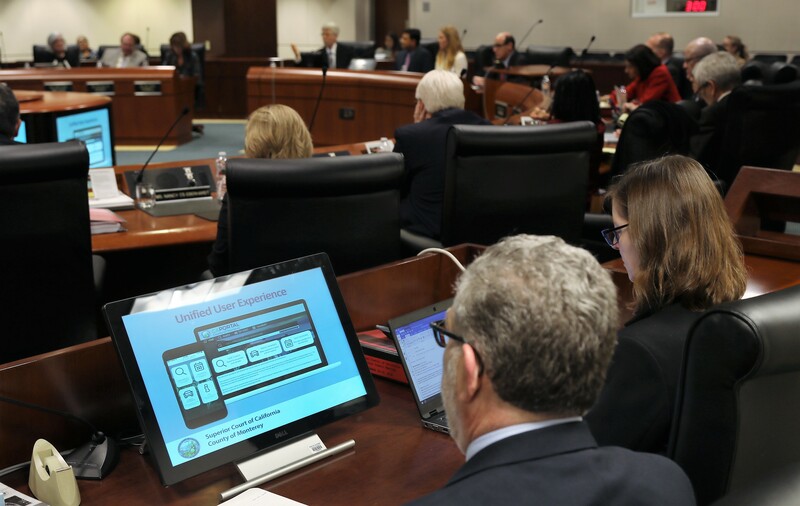 The Monterey Superior Court's online app is one of 50 programs funded through the council's Court Innovations Program, which supports court innovations and efficiencies replicable statewide. Rule changes will help implement Prop. 66, passed by voters to change the procedures for the review of death penalty cases. SAN FRANCISCO—The Judicial Council at its November 29–30 meeting approved changes to rules of court that govern appointed counsel in death penalty appeals and habeas corpus proceedings. One revision modifies qualification requirements for appointed attorneys in habeas corpus proceedings, including the number of years practicing law, legal and case experience, and training. The second revision creates new rules related to the vetting and appointment of attorneys for death penalty–related habeas corpus proceedings heard in the superior courts. Handling Traffic Cases Online: The council added three more trial courts (El Dorado, Fresno, and Monterey) to a pilot project that tests ways to take traffic court online, including looking up traffic citations, making ability-to-pay determinations for traffic fines and fees, and resolving cases. The council will analyze the results of the online traffic services to gauge their effectiveness and replicability in other courts.